This is the first in a multi-part opinion series on Ethical Reptile Keeping. The series seeks to urge keepers, new and old alike, to evaluate their own husbandry habits and to think about the impact their choices, from housing to breeding, have on their personal animals as well as on the herpetology hobby as a whole. 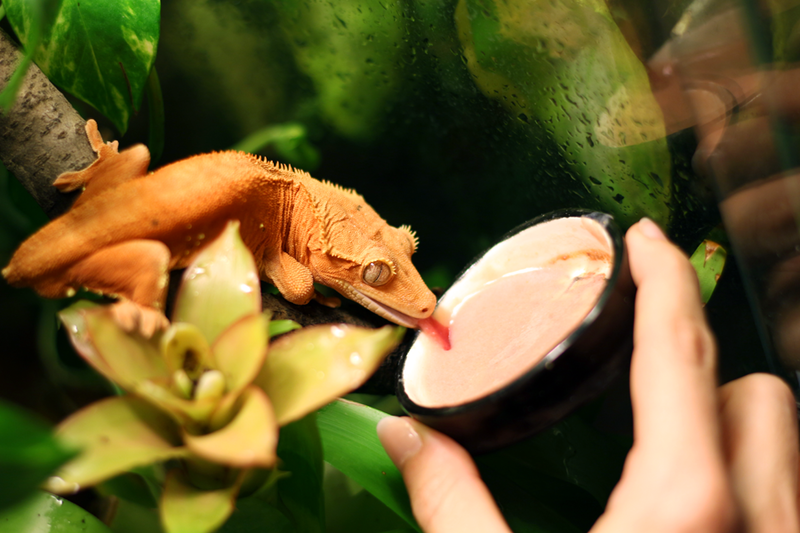 While some aspects of reptile and amphibian keeping have evolved to focus on pushing and advancing husbandry techniques to ensure that a species thrives in captivity, others have become stuck in antiquated and short-sighted practices which do not promote progress. And certain species, particularly entry-level species, are suffering as a result. I wish to draw attention to these embarrassing aspects of the herp community and encourage people to take a look at how they can grow as hobbyists and keepers, push what we know about great husbandry together, and strive for excellence, personally and as a community. "Reptile Keeping: 9 Signs You're Doing It Wrong!" I'm going to go into some of the points he makes, and why I wholeheartedly agree with him. I think the most striking statement is that most people cannot recognize the difference between an animal surviving vs. an animal thriving. Thriving. This is what we should be striving for if we're going to take on the responsibility of keeping any sort of pet in captivity, and if we're not, then we shouldn't be keeping these animals at all. It just seems to obvious, but somewhere in the miasma of information online, Youtube video tutorials, and forum ramblings, it seems that people miss the mark. Two male panther chameleons share an "intimate" moment in the shower. If one of these were a female and they mated, their offspring, though of different locales, would not be a true hybrid. Different panther locales are still the same species, F. pardalis. "Can I breed my panther to my veiled chameleon?" In honor of Valentine’s day this year, I thought I would write a little something on chameleon relationships. Or well, perhaps “relationship” is too romantic a word… let’s just say chameleon breeding. I get all sorts of questions emailed to me on an almost daily basis and one I see quite often revolves around a curiosity regarding hybridizing different species. I understand this curiosity, and can even relate to why people would like to do this; to be able to, in a moment of Jurassic World-like manipulation, create a creature that brings together the best components of a few species. Say, the size of a Meller’s chameleon (T. melleri) and the triple horns of a Jackson’s chameleon (T. jacksonii), but with the colors of a panther (F. pardalis.) If such a phenomenal cocktail chameleon existed it’s quite possible that I would be standing in line, money in hand, to purchase one immediately. However, since most of us do not have access to the latest gene splicing lab techniques, this limits us to the basic truths and limitations of breeding and genetics. The answer to this question is that technically, yes, they physically could. Leave a male and female of two different species together and they may do the deed instead of fight with each other. The right question, however, is would such a mating result in fertile and viable eggs? This is where it gets tricky. In order for two species to make viable babies the two species need to be very closely related, and usually that means they are in the same genus (i.e., Furcifer pardalis and Furcifer oustaletii), which usually goes hand-in-hand with how closely the natural territories of the two species overlap. In the case of the two I just mentioned, panthers and Oustalet’s, they would naturally overlap in regions of Madagascar. A panther and a Jackson’s chameleon are too distant, genetically as well as geographically, and not only are they too dissimilar genetically, but they don’t even use the same egg-laying strategy! One lays eggs to incubate while the other incubates internally and gives birth to live young. So such a pairing would never result in anything (except perhaps in injuries!) We face the same problem with a veiled and a panther chameleon, one belongs to the genus Chamaeleo and the other to Furcifer, they are too distantly related because one resides in Yemen and the surrounding areas while one is native to Madagascar. This means the two species probably haven’t shared a common ancestor in some time. This is not the same type of hybridization people talk about (as a misnomer, in my opinion) when they refer to crossing panther chameleon localities. 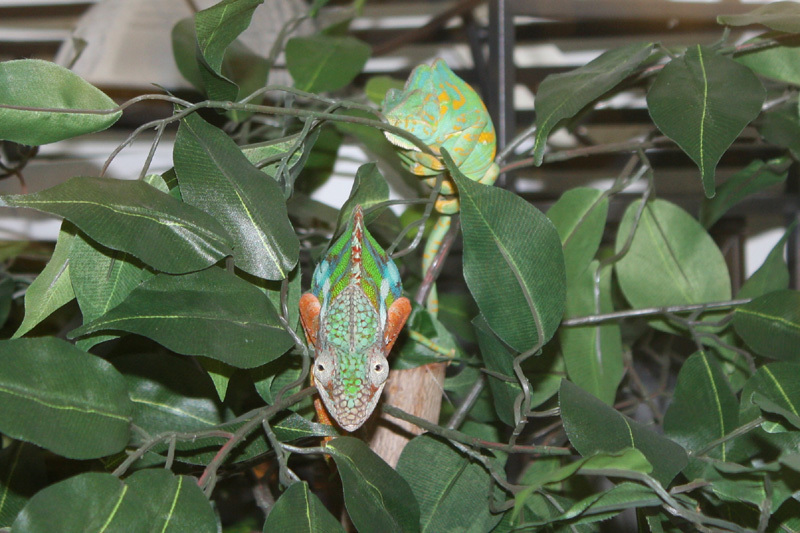 Panther chameleons, whether they are Nosy Be or Ambilobe or Sambava, are all one single species; Furcifer pardalis. The different color locales came about from a mix of sexual selection and geographical isolation, but they are all the same species nonetheless. 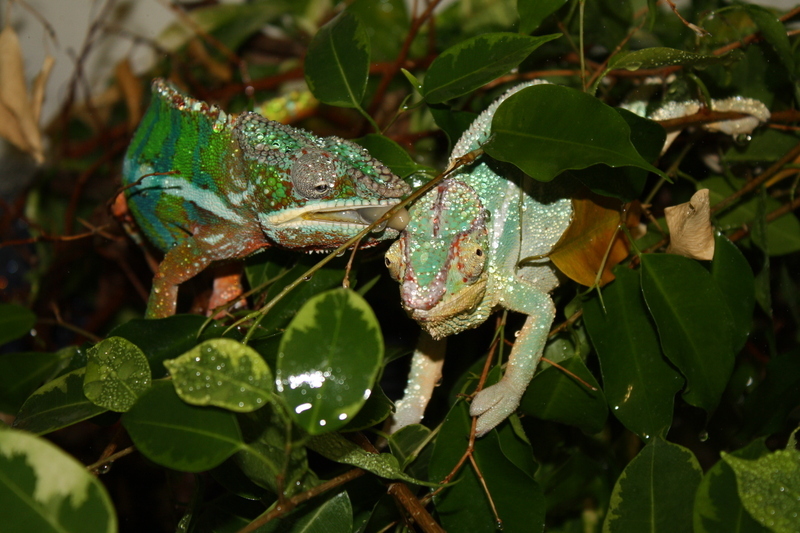 So when you cross an Ambilobe with a Nosy Be you are not creating a new species or a hybrid species, like a mule, you still have a panther chameleon but the offspring have lost the uniqueness of each parent’s particular locale. A panther and a veiled chameleon female roost together for the night. This combination would never result in viable offspring. Your next question may be, “Well, Olimpia, what I’m taking away from this is that certain species could technically hybridize, no?” And you’d be right, very tentatively. There have been reports of chameleon hybrids, but none that I am particularly familiar with nor that I could verify with any certainty. On the Chameleon Forums there was an entire thread about someone who had a clutch of live, viable offspring from a veiled and a Senegal chameleon, if memory serves, but as the months went on the babies perished and they never matured enough to tell if physically they looked differently enough to verify the claim that they were true hybrids. There have also been reports of panther and Oustalet’s chameleon hybrids, but none that I’ve heard about in a long time. What we can’t say with any certainty at all is whether hybrid chameleons grow up to be healthy, sexually productive individuals or not. I don’t have any information about this, unfortunately. And no one, that I am aware of, has ever raised up a hybrid (or several) and bred them to see if viable eggs could be produced. My recommendation is to leave the subject well enough alone if you are a new keeper and breeder. I understand the curiosity but I would not recommend that anyone try to do this. It is difficult enough for most people to take care of the chameleon species we already have, I would not encourage anyone to try and come up with their own hybrids now and go through what could be an exercise in futility trying to raise weak or sickly babies. Not to mention that it seems like an unnecessary risk to put two adult animals at risk of fighting and injuring each other. This is one of those questions that might be better left as theory and not as practice!